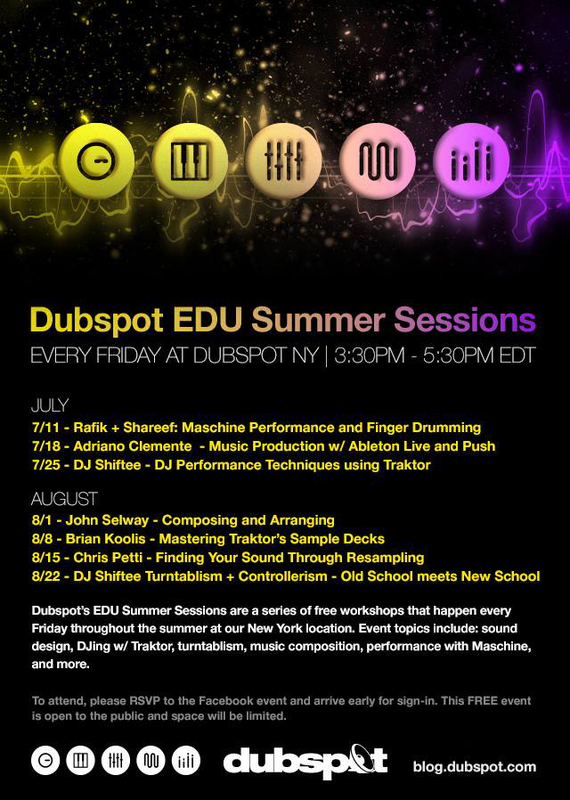 This Summer at Dubspot NYC we’re presenting a series of free music production workshops every Friday. The workshops for August include presentations from John Selway, Brian Koolis, Bill Lee, Chris Petti, and Shiftee. These workshops are free and open to the public. Space is limited, so arrive early and stay tuned to our Facebook page to RSVP. Learn to master Traktor’s Remix Decks during this free workshop hosted by Dubspot instructor Brian Koolis. This discussion will cover how to construct your own remix sets for different DJ styles such as house, hip hop, and trap music. Brian will also explain how to use your own loops from Maschine and Ableton with the Remix Decks. This workshop will be a presentation on incorporating resampling for Sound Design featuring Chris Petti and Bill Lee. Learn how to mangle your sounds in surprising and complex ways using the technique. Chris and Bill will also show some workflow tips to easily incorporate the process of resampling into your production process. 2-time DMC champion and Dubspot DJ curriculum director Shiftee will present and explain some of his turntable wizardry that has made him one of the most well-known and respected turntablists out there. Shiftee is not only a world class turntablist, he incorporates the latest digital DJing technologies available. He’s a unique blend of the old and new school.